High winds, heavy rain and a possible tornado in White Oak tore up East County yesterday, causing considerable damage and putting thousands of people in the dark. 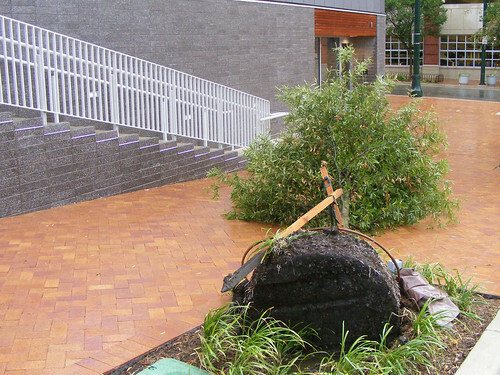 Newly-planted trees around the Civic Building and Veterans' Plaza in downtown SIlver Spring were toppled. The storm's heavy winds kicked up dust left over from construction, causing a rush of people out of the plaza before the rains even began. I felt serious deja vu discovering that the bridge on Route 29 at Burnt Mills Dam was once again flooded from the rain, causing serious backups in both directions. Power lines came down on Stewart Lane in White Oak, causing more road closures. This big tree came down at Stewart and 29 though, fortunately, no one was hurt. 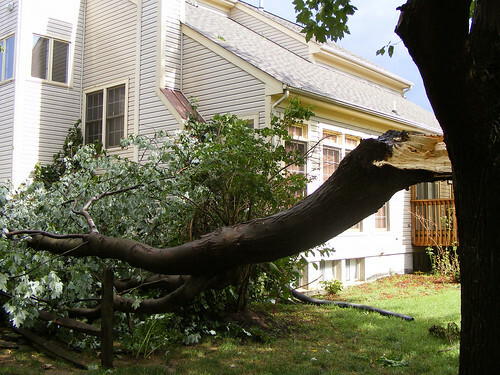 Back at home, several more trees came down, though the only damage we suffered was a broken window. 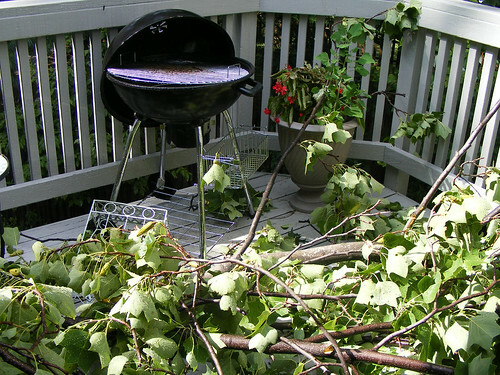 We won't be grilling for a little while, though. Our neighbor's house was similarly lucky. Had that tree fallen a couple of feet to the right, their family room would've gotten a huge skylight. What'd you see in the storm? If you've got any photos, leave links to them in the comments. (I'd offer to post them, but I'm still sitting in a dark house until I can get to a coffeeshop. 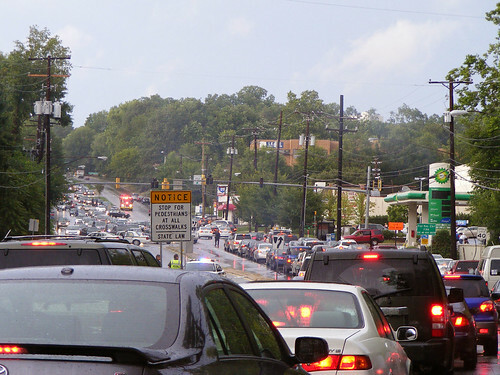 That bridge at 29 and Burnt Mills concerns me. On the east side, you have class 5 rapids (called the Colesville Crusher by some kayakers) and on the west side is that small dam. Big storms overflow the bridge regularly and have to be messing with it's foundations. The county or state has been working to put in sidewalks right by there and did some work on the bridge itself. I wonder if a replacement is due. I plugged my electric car in last night went to sleep and lo and behold- no power. I get to the service station- no power- no pumps no gas..
By now -no way to get over- I had used up my last amount of gas. I walked home- maybe I will ride the bike to work. Got home- saw the bike-- it was smashed and twisted and banged up-- a tree had fallen on it. Went inside- poured me a vodka and went to bed. Have you found any documentation on the "tornado"? I am in 4 corners and swear I heard tornado sounds (have lived through a couple), but I cannot find anything other than the tornado warning (strong rotation) that was given during the event. 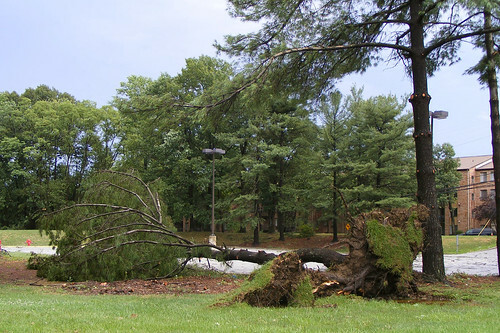 My family thought they saw a tornado here in Calverton, but according to the Capital Weather Gang, there weren't any actual tornadoes produced by Sunday's storm in the D.C. area. Dan, the U.S. 29 bridge over the Northwest Branch at Burnt Mills has been damaged by overflowing waters at least twice since 1970. The most-severe damage was after the rains that fell in June, 1972 when Hurricane Agnes dumped tremendous amounts of rain on Maryland. U.S. 29 was closed between Four Corners and White Oak for quite a few days. Some years later, another storm did more damage to the bridge, though it was not closed as long the second time around.